Most manufacturers will recommend that the seal be checked for signs of wear on a regular basis. Some manufacturers will recommend that the seal be replaced every 12 months. 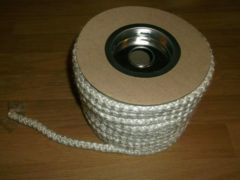 Glass fibre woven Stove Rope is suitable for stoves and is supplied by the meter. Fire Rope is manufactered from woven glass fibres. Fibre Glass Rope Seal: 3mm, 4mm, 5mm, 6mm, 7mm, 8mm, 9mm, 10mm, 12mm, 15mm, 20 mm, rope will be sent in one continous length. Stove Glass Gasket 8 mm and 25 mm – excellent for enabling an air tight seal between the glass and door frame. Rope glue black large 100 ml bottle. Stove end rope sealing tape (500 mm length).